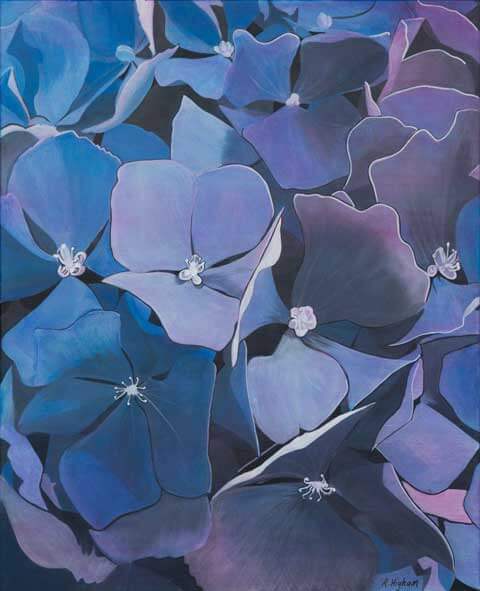 This painting is one of two hydrangea paintings created for a 2016 exhibition at Flagstaff Gallery, the other showing the pink variety of the flower. It was inspired by flowers in the artist’s garden and takes a macro view of the flower, each set of petals becoming a landscape of its own. Higham takes great pride in his garden and has spent much of his life cultivating plants for pleasure. Acrylic on canvas, 2016.